Steven Gerrard tonight overcame his Aberdeen hoodoo at last with an ultimately-deserved win at Pittodrie. Ibrox Noise takes you through our post-match ratings for a huge win in the north. I've defended Gerrard on here many times but I thought he had a poor night tonight. We didn't play that great in the first half but still managed to go in 3-1 at half time. However the wheels really came off after the red cards. McInnes changed his line up to suit while Gerrard did nothing. We played like we were a man short grimly holding onto what we had. Even though Defoe did eventually come on and score the right move should've been Lafferty who would've been much more of a presence running the channels and giving us an out ball. 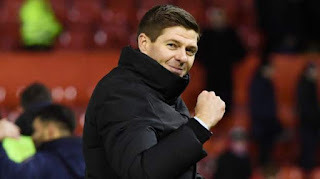 Although we won the match I don't think we can claim that Gerrard outfoxed McInnes. In some ways I think we got lucky and we need to learn how to manage games better and stop shooting ourselves in the foot. McGregor lucky not to get sent off and maybe even give away a penalty. Not his first piece of stupidity! Tavernier for giving away the penalty. Stupidity! Morelos for kicking out and once again dumping his team mates into trouble. Stupidity! Candeias getting booked when he was subbed. Stupidity! I agree with Andy c! Barisic never one one tackle and was pedestrian at times. Lack of application needs to wake up. Stewart destroyed him all night. Defoe, didnt do anything but popped up with a goal, that's why we signed him. If we wanted someone who does nothing but pops up with goals we should have kept windass. He wasn't on half the wages of Defoe.